Forsaking All Others is a 1934 comedy that is absolutely star studded. It stars Robert Montgomery, Joan Crawford, and Clark Gable, with the great character actors Billie Burke and Charles Butterworth in smaller roles. 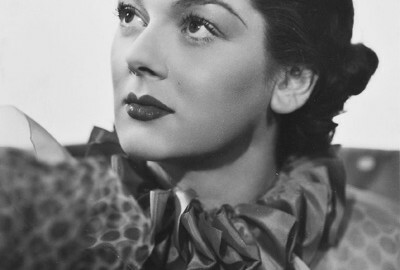 Our one and only Rosalind Russell has an even smaller part, and although her character is sprinkled here and there throughout the movie, her role is fairly tiny. The upside of it is that her character, Eleanor, has some of the funniest lines in the film. In fact, all of her lines are comical. She is almost never serious and she entertains us. This film is about three friends who grew up together—Dillon Todd (Robert Montgomery), Mary Clay (Joan Crawford), and Jeff Williams (Clark Gable). Dillon and Mary are about to get married as Jeff blows into town to tell Mary of his love for her. Fortunately, he finds out about their impending marriage before embarrassing himself. 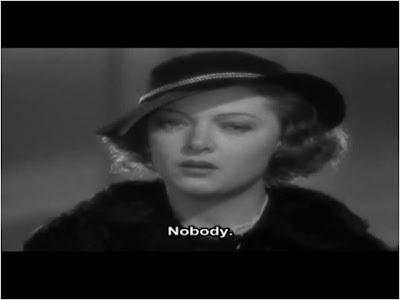 As the men are about to leave for the bachelor dinner, Eleanor (Rosalind Russell in case you got lost in all of the characters’ names) says she wants to go to the dinner and Shemp (Charles Butterworth) says to her, “Can you do a fan dance?” to which she replies, “Do one? I wrote the fan dance.” Roz’s role is one of comic relief—she’ll appear in the scene, say a funny line, and essentially disappear from the scene. As the story unfolds, we discover that Dill will not be a faithful husband as an old flame of his, Connie Barnes (played by a very young Frances Drake), comes calling on him and before you know it, he has run off and married her, leaving Mary at the altar the next day. The rest of the movie centers around the three main stars mostly, with Charles Butterworth there for support as a close friend of Jeff’s (Clark Gable). Needless to say, the marriage between Dill and Connie doesn’t work out (yeah, I was expecting that) and he tries to make it work with Mary again. Stupidly, she falls for him again, but in the end, she realizes that Jeff is the one who will love her honestly and faithfully, and she goes after him as he leaves the States on a boat. Some of the best scenes involve Robert Montgomery, such as when he gets drenched in the rain and when he comes to a cabin with Mary, he is forced to wear a silly-looking nightgown with frills. He then tries to make a fire because they are freezing but he doesn’t know anything about making one. He eventually sets the nightgown and himself on fire. Although this isn’t funny in theory (imagine if you were him! ), Bob’s reaction to it is priceless and you can’t help but laugh. So the next day he has bandages on his hands from the burns and is nursing a cold. Another funny scene is at a party that Dill and Connie give for some friends and we see (briefly) Eleanor and Shemp dancing in the living room. The way they dance past all their friends, completely deadpan looks on their faces, is too funny. Eleanor: Oh, I’m so tired of being a bridesmaid. I’d like to get married so I could wear a decent hat. Shemp: That’s the best reason for getting married I’ve ever heard. Eleanor: [After Jeff has starting pounding on the door to get inside] Wait a minute, big boy! Don’t break it down. We’re in church! Who do you think you are, a fireman? Eleanor: I was just wondering if they use lilies for weddings or funerals. 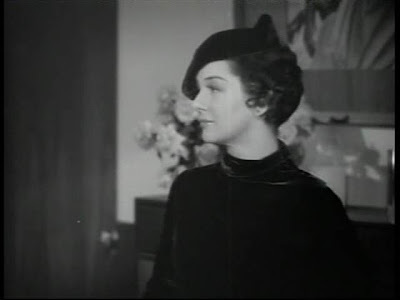 Rosalind Russell’s second film is not a great one. It has a stuffy, uninteresting script and is sometimes confused by the large mass of characters in the film. You never feel like you get to know many of them and it makes it much more confusing. Russell is billed 12th in this movie, her name lost in a sea of character actors during the credits. She is in three short scenes. This is interesting because she was in about 3 scenes in her previous film, Evelyn Prentice, but billed fourth. However, despite her billing status, she has a great deal more lines in this film and does very well. She is impressive as a Washington lobbyist’s wife, especially in her second scene, in which she takes full command of the scene and the six other actors in it, stealing the scene from them all. “The President Vanishes” is about a president who wants to stay out of the war, but with Europe at war, so much of the country (and politicians in Washington) want to get in on it. The president is played by Arthur Byron and at times, I would forget he was actually the president because there are so many characters in the movie. However, this was also due to the fact that this movie is rather rare and so my copy of it has good quality in neither picture nor sound. A Washington lobbyist is against the idea of war, along with the president, and his wife, Sally (Rosalind Russell) feels the same way. When we first see Roz, she is applying her lipstick in the mirror and making sure she looks “perfect.” When her husband comes into the room, she says to him, “In two minutes, these perfect lips would have been sealed. Where I draw the line, no man comes through.” However, he kisses her anyway and informs her that they will be giving a dinner party that night for five men who “are going to arrange to get America into the war.” When she hears this, her eyes widen and she stops what she’s doing, her face changing from surprise to anger. When she gives the dinner party for the five men, she does most of the talking as she sits at the head of the table like a queen. In talking to the five men, she charms the pants off of them, talking about their best qualities and talents, although there is poison apparent in her tone. Addressing each of them, she says (always with a smile), ““I live with my husband, Washington’s greatest lobbyist. He brings to my poor table the charm and brains of America—Edward Cullen, who knows more about steel than Midas knew about gold; Barton Drew, our greatest banker, whose bolting vaults would put poor old creases to shame; and dear Roger Grant, who binds 10 million readers with his chain of newspapers; Judge Cochran, defender of the Constitution, lover of liberty, friend of the people… especially the right people.” With that, she says to them, “So you see, gentlemen, why shouldn’t I be wise in the midst of these five greatest of great men?” Before she leaves the room early, she implies that they are eagles circling the sky above Washington. The men start arguing about going to war after she leaves and as the scene dissolves, a cutaway shows a group of six eagles attacking each other. In order to keep the public’s mind off war, the president stages his own kidnapping, implying it was the fascist group “The Gray Shirts” that are the culprits. A large Washington meeting is the last scene in which we see Roz. She comes into the room late and sits next to her husband. She tells him there was a mob outside and it was hard to get in. She remarks, ““I feel as if I were sitting on the edge of a volcano,” to which her husband replies, “You are.” It is then announced that the president has vanished and it is almost certain he has been kidnapped. Roz gasps, putting her hand over her mouth, as the president’s wife faints in shock. The scene closes and that’s the last we see of Miss Russell. The rest of the film is not really worth seeing, especially in such bad quality. 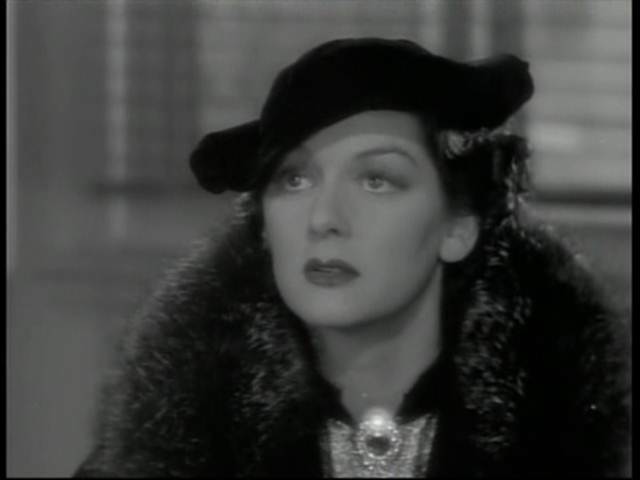 However, Rosalind Russell is a very interesting part of the cast and worth seeing, if at least for the dinner party scene.